Whether it is THE gripe porcina (swine flu) or just a normal cold/flu, I don't know. I have a runny nose, sneezing, headache, sore throat, slight body aches, and a terrible cough that feels like I'm going to blow my brains out. My ears hurt, I think from coughing so hard. I don't think that I have a fever (it's hard to tell when the climate is so hot), so I don't know if that rules out the swine flu. I hope so. I think I will go to the hospital tonight or tomorrow if I feel worse. I'm not sure if there is anything they can do anyway, since I read that La Ceiba's supplies of antivirals were sent to the island of Roatán, I suppose to prepare for protecting tourists. El Jefe checked at one of the larger pharmacies and was told that they have nothing for the disease and nothing will be available until the government buys and distributes it. Si Dios quiere. (God willing) This isn't the USA where I heard they have some 73 million courses of treatment on hand. In Honduras, there are 10, not 10 million, just 10 units, and those are privately owned. El Jefe called the doctor and he doesn't believe that I have swine flu since I don't have a high fever. Okay. Who knows. Si Dios quiere. He prescribed some other things for the cough and sinus problem. Wouldn't you know that Monday and Tuesday we were out and about, around a zillion people all day. I should have stayed home as that is probably how I caught it. What a worrisome time to catch a cold or whatever it is! 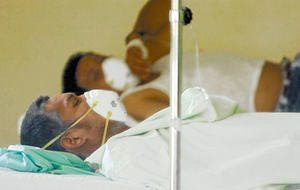 Honduran health officials have reported the first case of Influenza A in San Pedro Sula. The analysis will be sent for confirmation to the Center for Disease Control (CDC) in Atlanta, USA, as Honduras does not have the technology to determine the subclassification. Online newpaper Proceso Digital accused the Honduran government of covering up two confirmed cases of swine flu in La Ceiba, Honduras, based on a report of an unnamed public health official who said that he has not been authorized by the government to give out information. 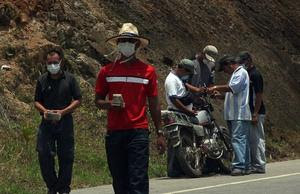 The two suspected cases of swine flu (la influenza porcina) were reported in La Ceiba yesterday. One is an American who arrived here on Saturday from the US as part of a medical brigade team. The other is a Honduran woman who lives in a colonia near us, just outside of central La Ceiba who had recently visited with someone who had traveled from Mexico. Specimens have been sent to the central laboratory in Tegucigalpa and it was reported that the results would take at least three days. Proceso Digital reported that the procedure in this case is to test for Influenza A. If the results are negative, swine flu is ruled out. If the results are positive, the specimen is sent to the CDC for confirmation. Needless to say, this procedure is going to result in significant delays in reporting actual statistics, just as it does with dengue (a common tropical disease in Honduras). On April 29, La Prensa reported an additional eight suspected cases have been reported in Puerto Cortés and five in San Pedro Sula, Honduras. Eleven of the 15 patients have recently arrived from Mexico, one from Guatemala, and one from the US. Names of the patients are included in the above linked article. La Prensa also has a map showing locations of suspected cases but I don't know whether it will be reliably updated. The numbers are a moving target, with two additional cases reported in El Progreso on April 30. While some 9-12 of the original suspected cases have been determined not to be swine flu, new suspected cases are being added daily. The first suspected case of swine flu in Honduras and at least four others since then are people who have been deported from Mexico. Honduran officials have asked both Mexico and the US to stop deporting Honduras back to Honduras during this crisis. The largest public hospital in San Pedro has set up a tent area outside to attend to suspected cases. The hospital is out of anti-virals, but the Health Department has requested L.250 million (US $13.2 million) from congress to purchase supplies, medicine, and other necessities. Pharmacies are reporting shortages of drugs, masks, and disposable gloves. A pharmacy here in La Ceiba said that the drugs would not be available until the government purchases and distributes them. The San Pedro regional director of health says that it is time to cancel all public events and recommends that employees in airports and ports wear gloves and surgical masks. "Better that it is said that we took exaggerated measures than to have problems that get out of control." However, labor leaders have said that nothing is going to stop the May 1 (Day of the Workers) marches which are expected to draw tens of thousands of people. The government has not taken an official stance. The president of the medical association of Honduras reported, "Our position is very clear that people should avoid public events," a recommendation made by the World Health Organization as well. Persons arriving at Honduran airports, seaports, and land entry points are being screened in a coordinated effort by Immigration and Health departments, but flights from Mexico are still being allowed. The government's response has been categorized as 'erratic'. Newspaper reports are not encouraging and information is often conflicting. While the Minister of Health reports that there are no confirmed cases in Central America and that the government is taking all measures (whatever that might be), the newspapers report that there are no medicines and no resources to fight an epidemic and that there are two confirmed cases of swine flu in Costa Rica. Some of the people don't believe there is an epidemic and others believe it comes from eating pork. As of this moment, no public activities or schools have been canceled. The mayor of Tegucigalpa, capital and largest citiy of Honduras with a population of more than 1.5 million, declared the city to be in a yellow alert. Political squabbling ensued, with COPECO and others claiming that the mayor does not have the right to declare an alert. The opposition party plans to distribute masks. It just made me laugh. How about you? 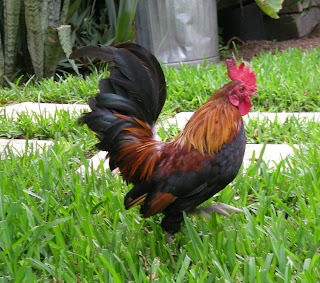 A long time ago, we gave one of our bantam roosters to my nieces and nephews. They later got a regular-sized white hen to keep him company. While the main reason for wanting chickens was for the eggs, the kids treat the chickens like pets. They can hold their arm out and call the rooster and he will jump up on their arm and wait to be petted. They love those chickens! I told you the story about how they brought their rooster with them when they visited because they were worried about him being stolen. 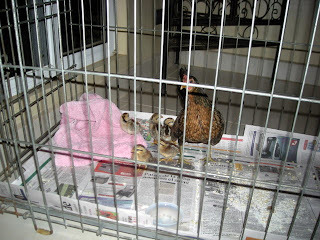 Eventually, they wanted another hen which we promised to give them. Little E said, "will you bring it tomorrow?" We said we would try to catch one. "If you can't bring it tomorrow, will you bring it on Sunday?" Yes, we'll try. "If you can't bring it on Sunday, will you bring it on Monday?" Yes. "If you can't bring it on Monday, will you bring it on Tuesday?" We laughed and said we would do our best. Unfortunately, we couldn't catch the wild tree chickens (another story) so it was quite some time before they came over again and helped us to catch one. It took a good 30-40 minutes of all us running around the yard, trying to corner a hen before we finally got one. The kids were so happy. They did as we said and kept their new hen locked up in their little coop for three days so hopefully she would know this was her new home. Being a wild tree chicken, however, at first chance to get out, she flew up into a tall tree and that is where she insisted on sleeping every night. Eventually, the roo abandoned his life-long partner and began sleeping in the tree with the new babe. The kids loved their pet chickens. They feed and take care of them. They play with them. They display them to visitors. When they go missing, the kids search high and low and are very, very sad until they come back. Once the white hen disappeared for a couple of weeks. Apparently she had been stolen by a neighbor but made her escape and returned to her loving home where she was happily greeted by her family. One day, a neighbor's dog got out and chased the chickens. Nephew E heard the commotion and ran outside. The rooster and large hen flew off, but the dog snatched up the bantam hen. E screamed at the dog to let her go, but the dog viciously gnawed at her and then flung the bleeding body to the ground − all right in front of 9-year-old E.
His mom took the hen inside to see what she could do for it but it was too badly wounded, her chest was ripped open. He was devastated and cried and cried at the horrible fate suffered by his beloved pet. Somehow, if the dog had eaten the chicken because he was hungry, that would have been easier to take than outright murder. Later he sadly told the neighbors (the dog's owners) about what happened and they laughed and said it must have been the chicken's fault. Remember the $74 banana split? Inflation has struck. It now costs $99, a 34% increase in two years! 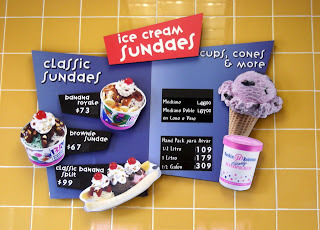 Actually that should be L.99 (lempiras, the monetary unit of Honduras) or about US $5.24, a big rip off it seems to me since they make these little tiny scoops of ice cream, not the regulation size I remember from the old days back in the US. I still don't know why they use dollar signs on one side of the sign and lempira signs on the other. This photo was even taken in another city (El Progreso) so I guess it must be store policy. How about L.309 for a half gallon? That is US $16.36!!! Please. Ben & Jerry's it is not. Needless to say, my initial excitement about the Baskin Robbins opening in La Ceiba has gone by the wayside. When I want good ice cream, I'll make it at home for a lot less cost than this. I don't mind paying more for quality but I just don't like to feel ripped off. 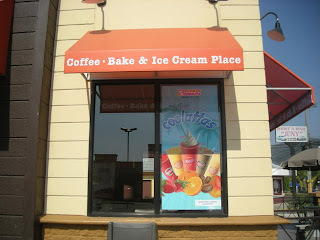 While I'm ragging on Baskin Robbins/Dunkin Donuts, let me ask you...Is this what your Dunkin Donuts sign says? Shouldn't this read, "Coffee, Bakery & Ice Cream Place"? I really need to know this as it bugs me. While there are usually customers lined up for the donuts, sandwiches, and coffee, it seems that a lot of customers must agree with me because I rarely see anyone in line for ice cream. We do like the Dunkin Donuts and the coffee drinks. And I like the pretty landscaping outside, though it is way overplanted. They will be removing half of these plants within a couple of years. Only one of my sago palms would fill this entire bed and this little spot has three. Where these are planted, they are going to cover the entire sidewalk and one parking place before long. That is one thing I can say about the US food franchises − they generally have at least a tiny spot of pretty landscaping outside. 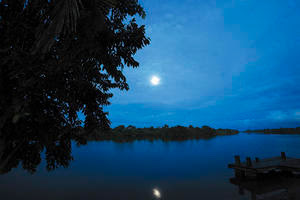 The section titled The Isthmus includes several other photo essays of Panamá, Costa Rica, Guatemala, Belize, and Nicaragua. His site also includes photo essays of many other parts of the world. Well worth a visit. Thankfully I am a touch typist. Why the 'Q'? Obviously from the photo above, the 'E', 'N', and 'S' are my favorites. 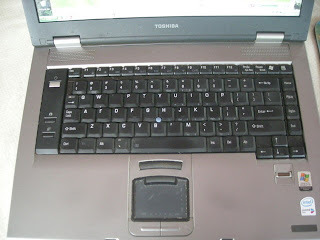 I used a little sewing machine brush to try to clean out underneath the keys − which was difficult as there is almost no space between the keys. I pulled out a ton of dog hair! My dogs like to take turns sitting on my lap at night when I'm on the computer. Those waiting their turn line up on the left and when they tire of me, they jump off on the right. 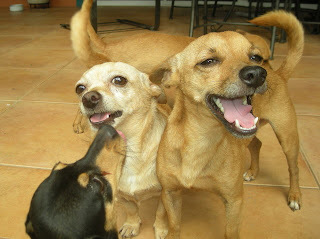 This is the only manner in which these chihuhuas are orderly. The key still wasn't working great but at least I could eventually get a 'Q'. Today it is healed. Hallelujah! By the way, Playa Taty is no longer open for lunch but the restaurant is open 7 nights a week now. Go! You must go! This maid had an terrible attitude from the very beginning. She seemed to forget who was the dueña and who was the worker. She argued about everything. I knew that was a bad sign. I've seen how maids act around their Honduran bosses and I knew it was NOT like this. Hey, I'm nice, I'm reasonable, I'm tranquila. Really I am. I don't yell or call anyone stupid. I'm patient. I'm grateful for the help so I treat people like I would want to be treated. I generally let the workers do their own thing at their own pace, within reason as long it is isn't going to damage our things. El Jefe tells me that I'm too nice and too friendly. But this girl had Attitude. After a generally unpleasant morning, the girl was washing dishes. Bang! Bang! Clunk! Clatter! Clunk! I've never heard such a noise from washing dishes. She was tossing them into the sink for rinsing and then piling them up precariously to dry, where if one thing slipped, they would all go crashing. I asked her to be careful so as not to break anything. She said, "No, I'm not going to break anything." I tried to show her how to stack the dishes neatly on the racks so they wouldn't slip and break. "No, they are fine." I explained how stacking the heavy pots on top of the delicate things wasn't a good idea. "No, don't worry. This is how I always do it." "But this is how I want it done." In response: Bang, bang, clatter!, as she tossed a few more dishes into the sink. Finally, I started rearranging the dishes myself and found a big chunk broken out of one of the bowls. "Look," I calmly said. "This is what happens when you aren't careful with the dishes." Rather than an apology or at least a little embarrassment, I got yelled at. "No! I didn't do that! It was already there! You must have done it!" Ooh-ooh-oooh. I was dumbfounded. I felt my ears turning red and my hair standing on end. If there is one thing I can't stand, it is chipped dishes so if it had been chipped before it would have been burned into my brain. I would have noticed it at lunch. It was also the third time that a maid had ruined something and tried to blame it on me! Can you imagine the stupidity of that? There are only two people living in this house and we don't lie to each other or blame our mistakes on others. I know that bleach poured straight on my sheets will burn holes in them. I know that a brillo pad will ruin non-stick pans. I know how to turn on something without breaking the handle off, and what is more, El Jefe knows that I know these things! But somehow these maids think that El Jefe will believe them, a complete stranger, over me. It's crazy. "Leave my house." She stared at me in disbelief. "Get your purse and get out of my house! ", I clarified. "But you wanted me to work!" she argued again. "I'm not going to have anyone in MY house who breaks my things and then lies about it." "But, I didn't do it! But, but....." "Out! I'll get your pay. I don't want you here." And out she went. So much for being tranquila. I have to say that it felt good. I enjoyed it. Heheheh! Nobody is going to push around La Gringa anymore. I'd like to say that I hoped that the girl learned a lesson, but I really doubt that. There is another side to this story. El Jefe had been working outside that day with a long time worker Carlos. Carlos was very aware of the problems we've had with undependable and thieving maids and had even warned us a couple of times. El Jefe had been in and out of the house a few times and had heard some of the conversations. I had also been outside to get his advice about the best Honduran way to handle her disagreeableness, so they both knew a little about the difficulties we were having. It seems that they had a bet going. El Jefe said that the maid would only last a week. Carlos only gave her two days. So when we both came storming out the front door, barely after lunchtime on the first day, with me shoving some money into her hands, they both burst out laughing. The maid made one last parting plea to El Jefe, but he told her, "She's the boss." 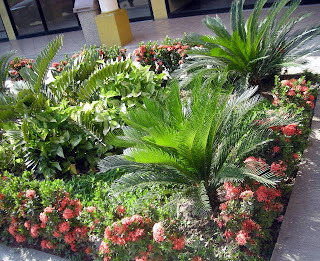 Some tropical plants would take over the world if allowed − at least the tropical world. Every few months we hire a couple of guys to cut back and clean up some of the overgrown plants. I don't mean pruning. I do that because I don't want anyone taking a machete to my plants. I'm talking about hacking back into their allowed space, cutting them off at the ground, and/or digging them up by the roots. We have no end of compost materials. Between the mountains of trimmings and the wood shavings that a carpenter brings to us, we always have huge compost piles going. 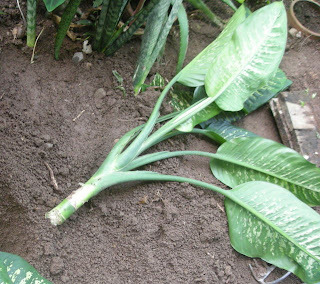 But over the years, we've found that some plants will just continue to grow in the compost. Elephant ears, costus, and Dieffenbachia maculata are unstoppable. 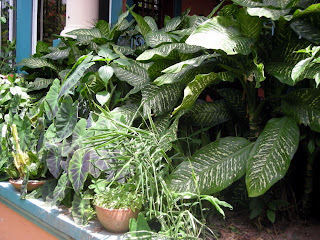 When these Dieffenbachia get leggy, I just dig them up, cut off the leafy tops and plant those in the jardinera (planter box). Water them in and they are good to go. This last time, I had so many that I thought I would plant a few around the garden, too. The decapitated tops sat in pots and buckets (with no soil) in the heat for a week or two before I got around to planting some of them. The rest remained in this bucket with no soil or water for another month before I finally threw them out. They were still alive! The leaves were barely yellow and hardly wilted. We originally tried composting the discarded stems and plants and they just grew in the compost. We tried chopping them up with a machete and throwing the remains in the compost. They still grew. We tried setting them aside to dry up in the sun and they still grew. The workers, explicitly against what we had told them, began throwing them in the jungle area behind our property. Very bad! 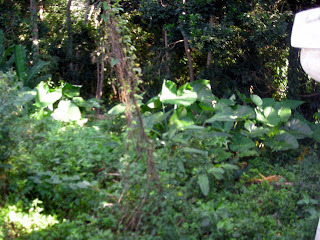 Of course, they grew and some, especially the elephant ears, are becoming invasive. 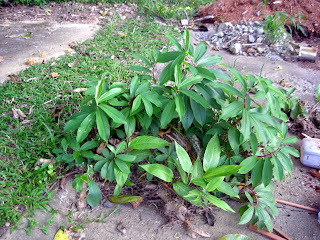 Last summer, I was able to get the workers to toss the stems in the side street on the concrete in the hot sun, thinking that the stems would shrivel up and then we could compost them. The workers had very stern warnings not to throw anything in the wild area. They thought that was completely crazy, as well as unnecessary since it is much tidier to throw the discards down by the creek where they will no longer be our problem. This photo shows the result of trying to fry them in the street. 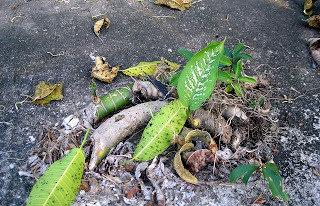 Even after months of the hot dry season, they grew in the leaf rubble that blew down the street. 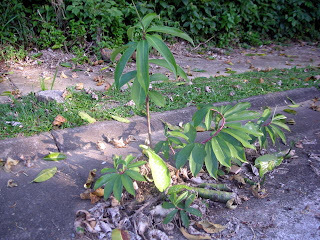 The concrete is so hot that it would burn your feet if you tried to walk barefoot, but no problem for these plants. 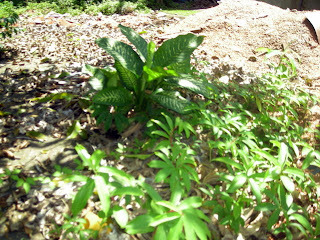 The recent photo show them thriving on the concrete after a few months of rainy season. Now what? Pile them up and have a bonfire? Is La Gringa is running a sweat shop? 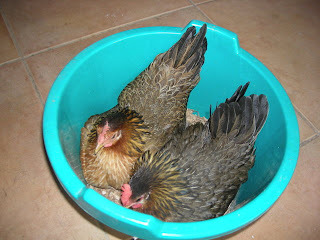 Bantam hens (miniature breeds) are notorious for their broodiness. 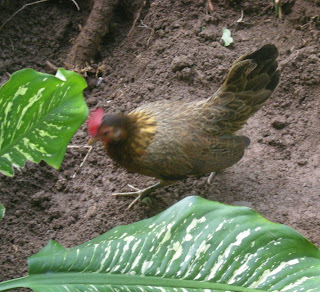 For those who don't know being 'broody' (culeca in Spanish) means that the hen desires to hatch her eggs and will sit on them for the three weeks that it takes for them to hatch, only leaving her nest once a day to eat, drink, and go potty. We have at least one broody hen (out of four) almost 365 days a year. While the hens are broody, they lay no more eggs, but as shown in this photo, a helpful friend will share her nest and drop an egg for her. We should go into the hatchery business! 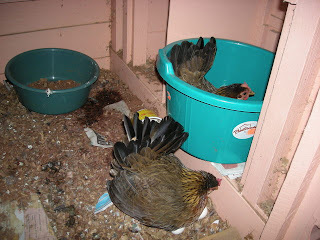 The hens generally lay in the coop and suffer the frustration of me coming in and stealing their eggs every morning. 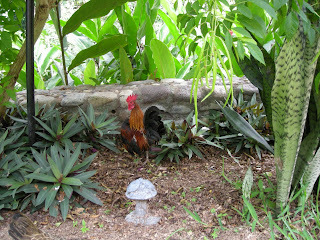 One of our wild tree hens (another story) apparently wised up to the human ways of stealing eggs. She made a little nest in the mulch and camped out in a little hidden corner that was protected from the rain. I didn't find her until she already had a large clutch of 16 eggs. Since I didn't know how long the eggs had been there (and didn't want any nasty surprises when I am cooking), I decided to let her hatch them. She had way more eggs than the little hen could possibly cover and keep warm − apparently the other hens were helping her − I removed all the ones which looked like rooster eggs. Some say that the eggs which are more pointy will be roosters, while the more rounded egg shape will be hens. The problem was that all that human disturbance drove mama hen away in fear and attracted the attention of the dogs and the roosters. I shooed them all away but when I went to check later to see if the broody hen had returned to her eggs, I found one egg broken open and all but two of the eggs were gone! I immediately suspected Chloe the Rottweiler since I didn't think that the chihuahuas could have carried off the eggs in their mouths. 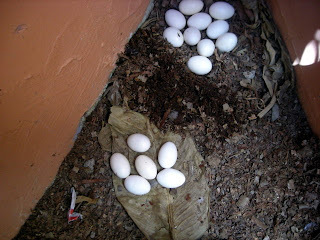 El Jefe told me to go check the other side of the house and sure enough, I found the remains of crunched up eggshells. Very, very bad dog. Egg eating is also a very, very hard habit to break once a dog starts. I was upset! I also wondered if it was possible that roosters had eaten the other eggs. El Jefe thought that was crazy but the broken egg I found didn't look like it could have been done by a dog. It had a large hole in the top and part of the egg still inside. Dogs would have done more damage to the shell, I thought. 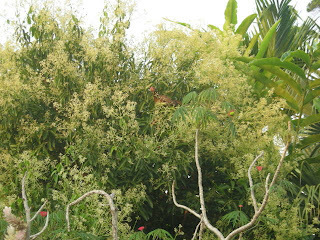 As I dejectedly walked back into the house, I heard some squawking and looked out the back window to see: One of the wild tree roosters waddling over to a shady spot and dropping an egg from under his wing for his picnic. He pecked it open and slurped up the egg inside! Ahah! I had learned from the Organic Chicken group that chickens CAN carry eggs and it was true. They sort of scoop them up under their wing and hold their wing tight to move them to another location. Eventually the hen came back to sit on her remaining two eggs and eventually the other girls helped her out by depositing more eggs. Feeling guilty, I didn't want to disturb her again and possibly be responsible for more egg carnage, so I let her be. 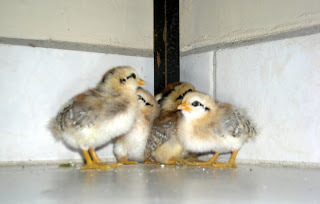 One morning, we heard the distinctive "peep, peep, peep" of a baby chick outside. We discovered that one of the chicks had hatched and had been taken over by another hen. Since the eggs were from different batches, the poor mama hen had to continue sitting on the rest of the eggs so she apparently allowed her first chick to be adopted. Chickens aren't so dumb as people think. 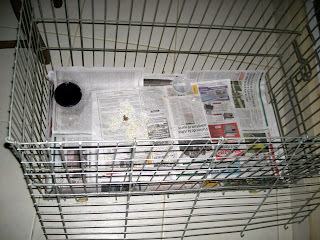 When a cold front was predicted, El Jefe and I decided to move her and her eggs to a metal dog crate inside for protection from the elements and the other animals. Here in La Ceiba, Honduras, 'frente frios' or cold fronts usually mean only slightly cooler weather but tons of rain. I wasn't sure how safe her spot would be from a deluge. What a wise decision that was! It turned out that we received 5 inches (12.7 cm.) of rain that night. It also turned out that the first chick pecked his way out of the egg the next night. Good timing! The strange thing about chickens, at least these chickens, is that while they seem to have a strong desire to continue the species, the other hens will kill the baby chicks. I don't know why this happens, but it often does. 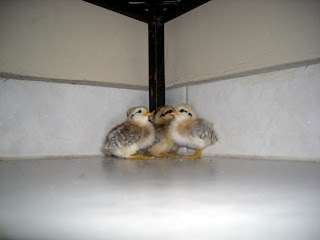 For that reason, I wanted to try to raise these chicks separately for at least a while. I don't know if we can keep them separate for the full recommended 6 weeks but we'll see. I kept the new maid a secret from you. If I wrote about my excitement of having a new maid, I was afraid that I would have to write to say that she didn't show up for work the next day. I've written sooo many of those articles that I had to set up a separate category. I was glancing through some of the articles and it was very sad. One day last month, the neighbor's cook came around to ask about something. She and El Jefe got to talking and he asked if she knew anyone who wanted to work. She immediately answered, "Awwwk! The women in La Ceiba do not want to work!" and went on and on about how lazy and undependable the (poor) women of La Ceiba are. But she ended the conversation by saying that she would try to find someone who wasn't from La Ceiba. We weren't hopeful. The following morning she showed up with a woman originally from Tocoa, a middling-size town near Trujillo, Honduras. She rattled off that this was her neighbor Arexy, that she (the cook) had told Arexy we would pay L.150 per day on a bimonthly basis plus L.60 daily for taxi transportation, that it took too long and too difficult to get from their barrio to our colonia by bus. El Jefe was a little taken aback since we hadn't discussed the pay or transportation, but we said (to ourselves later), "What the heck! Who knows if she'll even come back tomorrow." We had a brief chat with her trying to find out a little more about her situation (to see if she was going to be another one- or two-day wonder − not that you can ever really tell). Our house was admittedly a filthy pig sty so I tried to reassure her that we didn't expect that she could clean it in a day or even two days, and that the most important thing was to clean thoroughly − for the mother-in-law's inspection, as they say here − not to clean quickly. She mentioned that her father has been mean to her, telling her to "get out and get a job!" She is 27 and has a child here in La Ceiba as well as two more children living with their father in Tocoa. She doesn't say much about the former husband, but she seemed definite that she won't be going back to him. She methodically cleaned the first day and I was impressed with and complimented her on her detail work. At the end of the day, when I gave her the taxi money, I asked how she felt about the job and she said she liked it. "So you are coming back tomorrow?" She laughed and said yes. I asked, "Are you sure?" and she assured me again. The next day, she continued on with a couple of more rooms. She is very quiet and seems afraid to ask questions even though I've told her several times that it is better to ask than to make a mistake and that I won't mind her asking questions. I know that the variety of cleaning products and the fact that the labels are in English can be confusing. El Jefe asked how she liked working and she again said that she liked cleaning. She mentioned that she never had a job before (we didn't know that!) but that she liked cleaning her own house and her dad's house. I think that she also likes the luxury of taking a taxi to and from work. She also expressed concern that maybe we thought that she was working too slow. El Jefe reassured her that a good job was more important to us than speed. Each day, El Jefe and I had discussions like, "I wonder if she'll come back tomorrow" and "I'm glad that we only have to pay her twice a month so maybe we can at least get the whole house cleaned before she quits". I would excitedly tell El Jefe about seeing her stick the dust rag in between the carvings on the wood furniture to remove ALL the dust or moving the furniture to get the corner of the floors clean. He would look at me worriedly and say, "Well, just don't get too hopeful." He even discussed his concerns with his mother, that I was going to get attached and be disappointed yet again. You can see how all of these bad maid experiences have turned me into an insecure wuss. Arexy has been like only one other maid that we've had. She comes to work every day (it has generally been 2-3 days per week), she comes on time, she doesn't leave early or ask to leave early, she dresses neatly and modestly, and she does a good job. She never complains or argues with me or asks me to give her things and she seems very happy to have a job. It's only been a month, but I'm so hopeful. Arexy only came late one day. When El Jefe said that he thought that she wasn't coming that day, she sheepishly admitted that she overslept. I didn't say anything to her about it, but she ended up working an hour late − on her own − to make up for it! In fact, she's not a clock watcher at all. I have to remind her when it is 4 o'clock but she will always finish what she is doing first. I have to nag her to take a lunch break. At the end of second week, she asked for an advance of L.500. My mind immediately went into red alert since our experience has been that paydays or requests for advances are always a crap shoot. Once the worker is paid, you really never know whether or not they are going to come back. My only hope was that since we owed her much more than L.500, she would be back. I sadly told El Jefe later about the advance. He raised his eyebrows and gave me that knowing look: "Hmmm, we'll see." She came back. And she came back after payday, too. We are now beginning our second month and I have such high hopes! Again! Michelle Obama has started a gardening craze in the US with her White House vegetable garden. Whether it is a healthy back-to-basics movement, a result of the economic downturn, or simply wanting fresher, healthier, more natural food, more and more people are getting into vegetable gardening and.....Ta-dah! raising chickens. On an organic chicken discussion group that I read, reports are coming in that feed stores (agropecuarias in Spanish) in California can not keep baby chicks in stock. One store sold out an order of 200 chicks in 40 minutes and another in 20 minutes. People are camping out in the parking lots before the feed stores open in order to be first in line. Similar reports came from Idaho and Hawaii. Hatcheries have chicks on back orders which they can't hope to fill. A San Francisco feed store owner says that he has never seen anything like it. Californian feed stores are ordering chicks from hatcheries as far away as Texas because they just aren't to be found in California. A Pennsylvanian member reported that chick orders are up all over the country and that all the hatcheries are sold out or close to it. 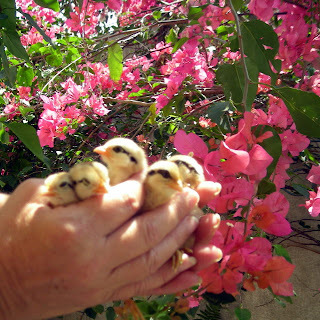 Chicks are said to be sold on Craiglist in California for US $5 each and laying hens for US $20-$40! A recent news story said that "Chickens In Your Backyard " is a best selling book in Ireland. I have my own hatchery going on here in La Ceiba, Honduras. Not by my choice as we would rather have the eggs, being greedy human beings. 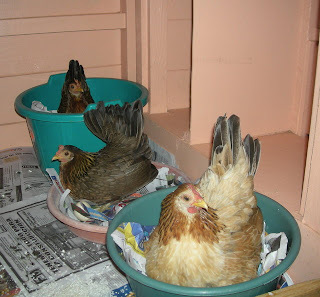 The bantam hens, however, have different ideas. 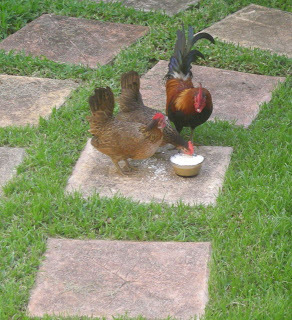 Their goal is to increase the species and take over the world with bantam hens. Too bad that I'm bigger and stronger. There was some concern expressed on the group whether all these new chicken 'farmers' would make the effort to learn how to care for their new chicks. Hopefully they will. That is kind of the American way: Buy some books, study it, research it on the internet, and do it! I'll admit that I knew nothing about chickens (except how they tasted! ;-/) before we started raising them. El Jefe's mom had had chickens when they were young so he was a little ahead of me. I feel like if I can do it, anyone can. Our nieces and nephews are enthralled with their pet chickens and seem to be taking very good care of them. If it is something that you think you might be interested in, check out a good beginner book. I was in the kitchen chopping vegetables when I felt someone watching me. Can you see it in the photo above? I went to get the camera, hoping it would still be there. It was and he let me sneak up closer to get a better shot. He just watched me and didn't seem skittish at all. 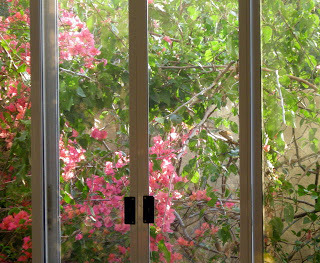 Then I thought I would really push my luck and open the window so that I could get a clearer photo. "No prob," said the lizard. "Here, do you want a profile?" 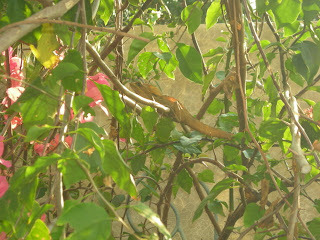 I think that this is a Basilisk (Basiliscus vittatus), called a garrobo here in Honduras. Kind of a weird, prehistoric little guy, isn't he? There is just something creepy about those elbows and knees. Did you know that this lizard is also called the Jesus lizard because he can not just walk, but run on water? We are going to get down and dirty today, folks, so if you aren't interested, you might just want to come back tomorrow. What the heck is it about the internet that brings out the worst in some people? Or is it not the internet, but the person's true nature shining through? There seems to be an innate belief in some that anything goes and nobody, nowhere, nohow is going to tell them what to do. Cursing, lying, slandering, spamming, threatening, stealing others' work − they believe all should be allowed in the name of free speech and woe to anyone who tries to stand in their way. 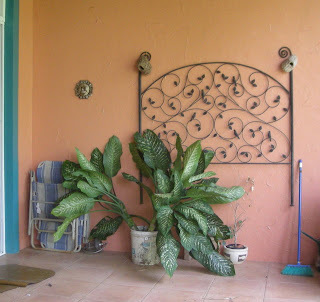 Honduras Living is a discussion group for expatriates living in Honduras, those considering moving to Honduras, and expatriate Hondurans moving back to their home country. We have a few simple, common sense rules that have served the group very well I think. In a little over two years, the group has grown to 850-plus members. We did not want a group dominated with misleading information from unscrupulous real estate agents or where people are afraid to give their opinions because they would be attacked by others. We started the group and that is our privilege to decide the rules − simple as that. Our group's guidelines ask members to be polite and considerate. Everyone's opinions are welcome as long as they can state them civilly without personal attacks. At times, I personally absolutely cringe at some of those opinions.... but I and the other moderators respect members' right to give them. Since members needs and wants vary, no internet group is going to meet the needs of all people all of the time. We just try to ensure that the group is the best that it can be for the majority of the members most of the time. One member's rights terminate when those rights step on the toes of other members. Of course, everyone always has the ultimate right to unsubscribe from the group whenever they feel the need to relieve themselves of the constraints of the group's guidelines. 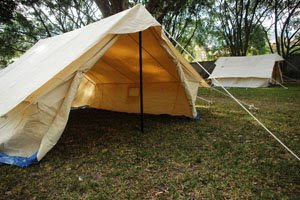 Overall, we have a great group of helpful, friendly people and most do their best to follow the guidelines. Invariably, those very few who cannot, or will not, will cry "censorship!" What they are really saying is that "I was too lazy to or couldn't get away with (advertising/making personal attacks/trimming prior posts/fill-in-the-blank) so I'm going to blame the moderators for being evil censurers." Recently, an either very misguided or unethical member decided to capitalize on the vast amount of information in our group. He copied a ton of members' messages from our group and put them up on a website. He was sent a form letter requesting that he remove all the information for which he did not have permission to use, which was about 98% of his site. Ultimately, he saw the light and removed the material, but not until after he had sent various threats to me. Since he couldn't go with his original plan, he set up a forum. Great! More power to him. If he works at it and has something of value to offer, his forum will succeed. If he doesn't, it won't. That is the ultimate law of the internet: It is not 'If you build it, they will come'. It is 'If you have something of value to offer readers, they will come back'. Unfortunately, in order to build up his forum membership, he again took the again unethical route. He harvested email addresses from our group and sent unsolicited email to our HL members. What was done was done, not much we can do about that. But then, yet again showing his true colors, rather than putting his own effort into making his site a place that people will want to visit, he decided that the only way to build up himself and his forum was to blast our group and me in particular with false claims. I guess he was thinking that our members would believe that and become so incensed that they would flock to his group. He has one strong supporter who you'll read about below. I had to include the information about him just for the entertainment value. Now ordinarily, I know how to deal with trolls and misfits. Ignoring them is generally the best option. Soon they get bored with their own griping or their new listeners get bored with the negativity and start wondering "Where's the meat? 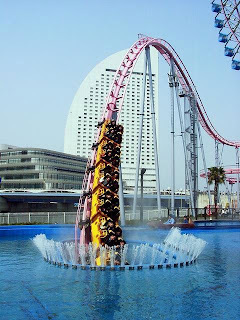 Why am I here?". That has happened before. Try as I might, this time I feel compelled to defend my reputation. I don't care if they don't like me or call me names. It has happened before and it will happen again. But when someone casts aspersions on my integrity, I can't let that slide. I wanted to post a rebuttal on his site, leave it at that, and let people make up their own minds about who was telling the truth. After 2 1/2 years of blogging my heart out and more than 2 years of our Honduras Living forum, hopefully people have a pretty good idea of my character. Two problems arose. One person advised me that since Nick owns the forum, he could alter or delete my message or enter a bunch of false responses from imaginary people supposedly supporting his claims. Wow! Why didn't I think of that? I guess I just don't have that kind of nefarious mind. The second reason is ironic. Despite his claim to have an open forum and allow anyone to post anything they want, it seems that he has blocked my IP address and I physically can't post a rebuttal to his attack on his forum! Hah. So much for an open forum with no censorship. It's just too funny reading the slanderous falsehoods posted by people to rationalize why they refuse to follow some simple guidelines. Nick stated: "You can count on the fact that no matter if someone pisses me off or not, I won't delete helpful info from MY site! " I guess he doesn't have to censor if he can prevent a truthful rebuttal to his false claims from even being posted in the first place. Nick, first, Yahoo Terms of Service are very clear about copying and reposting information sent by other group members. I'm sorry you weren't aware of that. If you had asked, I would have explained to you that not only could you lose your Yahoo account but your website could be shut down by your website host provider. Host providers take copyright violations very seriously. Second, yes, I sent a message to you pointing out your copyright violations. I thought it was fair to give you 48 hours to remove the unauthorized material − rather than simply filing a DMCA complaint with Yahoo and your website provider. The letter sent to you is a standard recommended form letter and there is nothing "nasty" or "rude" about it. You, however, were the one who sent three messages to us with various threats of trying to ruin my reputation if I didn't drop the matter, just as you are trying to do here, and just as you tried to do in the past. I didn't respond to your last two messages. You'll recall that the entire conversation was between you and all three moderators. We have all of the messages if there is still any question about who said what. Third, despite what you had done, you weren't banned from the group until you threatened to spam all of our members, which you have since done anyway. Harvesting email addresses and sending unsolicited emails to members of a group is also against Yahoo's guidelines and in general is considered a pretty slimy thing to do. And, yes, I have gotten complaints from members about it. Fourth, as far as accusing me of deleting your messages, that is a ridiculous claim. Any member can search the Honduras Living message archives and find all of your messages. NYPD stated, "I never insulted,ranted, made inappropriate comments, but the "powers" decided I did not have a voice . "on their private site" So like any Demagog. they ban people who voice an opposing opinion." Apparently we have a vastly different opinion about what is insulting, ranting, or inappropriate. The moderators did consider calling a pregnant woman "ignorant", "desperate" and a "moron" as insulting and inappropriate. We also considered telling an 80-year man to "grow up. get a life." as insulting and inappropriate. You also sent at least one abusive private email to a member and another one to the moderators. The moderators were trying to work with you on your inability to follow the group's guidelines, but abusing our members is not tolerated. It had nothing to do with your opinions. I don't recall reading any "opposing opinions" from you at all. I have no idea what your opinions are except that you have difficulty expressing them in a civil manner. Also interesting is the fact that NYPD complains of the discussions about the maquila closing dragging on. Obviously he didn't read the messages or he would know that Nick was the one who dragged them on and on with his 32 responses on the original thread and his 17 messages on the follow up thread started by him! Hah! There were many complaints about those threads from other members, but since we DON'T censor opposing viewpoints, what were the moderators to do? Would you propose censoring Nick? Or only allowing opinions with which *you* agree? Nick, I wish you all the luck on your new forum. I sincerely (really sincerely) hope that all like-minded people join you there. I do think, however, that when your ethics and veracity is questionable, people will have a difficult time relying on your answers. Remember that the same technology that gives you the power to make these false claims publicly also allows others to follow you and your reputation wherever you go. So that is the rest of the story -- the whole truth and nothing but the truth. I feel better now. Thanks for indulging me. 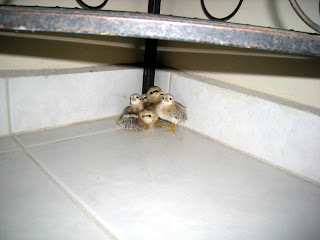 La Gringa lost (then found) her chicks! I really screwed up on Friday. We were cleaning out the dog pen (chick cage). I put the new chicks in a laundry basket and I decided to let mama hen outside for awhile to eat some grass and bugs and stuff. I thought she would hear her chicks and come back. In fact, I left two windows open she could get back to her babies. Wrong! 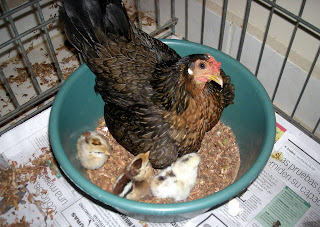 She discovered her first-born chick, who is being mothered by another hen and decided that she wanted that chick back! She followed that chick and hen around all day, being aggressive with the other hen. Other times she hung around the window where she could hear her chicks calling her but she wouldn't come in. 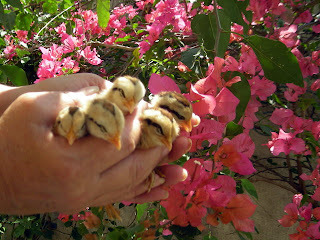 I held the chicks several times during the day to calm them. They decided that I was an acceptable substitute and would be quiet while I was holding them. They are so cute and so curious. In this photo, they are so comfy that they are falling to sleep. We also tried to catch the hen several times during the day with no luck. 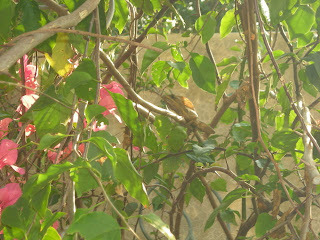 Someone tried to help us and ended up scaring her so bad that she flew up into the cinnamon tree. (She is one of the wild tree chickens.) At that point, I knew it was hopeless to try to catch her and hoped for better luck the next day. About 5 pm, I went upstairs. There was no more peeping so I assumed that they were asleep in their cage. About 6:30 I went downstairs and just went over to peek in on them. The pen was empty. NO CHICKS! Oh, my God! The windows were closed by then so I knew nothing could have gotten in to get them. The dogs were outside. They had to be somewhere. They let me catch them and I put a little towel in the pen so they could curl up and stay warm (as if that is a problem in La Ceiba!). Then, my luck holding, I heard a strange noise on the terraza and found the mama hen. She did not want to caught but between me, Chloe, and the chihuahuas, we had her cornered and I brought her inside to her chicks. Whew! One big happy family again. "This is what happens to a Teflon pan when a Latin American maid washes it with a brillo pad." I was hesitant about this contest because I knew that expats in Central America would have a huge edge. 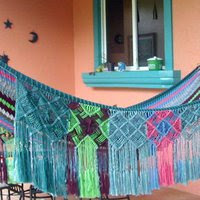 Don Ray: You are going to receive one of La Gringa's original design, one-of-a-kind recycled plastic market bags. I've been giving them away as I make them, so I need to rebuild my stockpile. I'll send you some photos when I get a few finished and you can pick the one you like best. In the meantime, you could let me know if a particular size, shape, or color would work best for you, e.g. veggie market bag size, laptop size, manly black color, etc. well your pot has had enough abuse and will be lodging a complaint with the relevant authorities. I have to admit that I'm glad that Haiku Joy did not win. I can't imagine how much it would have cost to mail something to Japan or how many years it would take to get there, if it ever did. 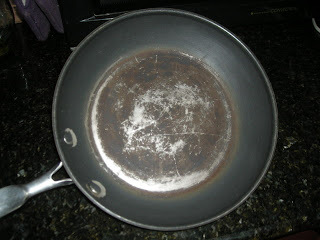 It is a pan with both new and old damage to the teflon, indicating this was not a one time incident where a maid washed it with a brillo pad. It is an old pan and likely only used for outdoor cooking these days. The photo was taken outside, which would lead me to believe you were maybe camping or for some reason cooking outdoors. If there is significance to the fact that it is empty, I would say someone lost or forgot the food items to be cooked. Several of you had the correct or very close to correct response, but unfortunately, Don Ray beat you to it. I also realized after I posted the contest that the email readers were at a big disadvantage since they wouldn't receive the article until the following morning. If I do another contest, I'll try to work out the timing better. Thinking of a contest that will be a challenge to you readers is....well, a challenge! For those of you who think that I do so much cooking that I wear out my pans, I have to dispel that fantasy before El Jefe gets on here to tell you how it really is! Actually, the full and complete answer would have been "La Gringa got a new maid and the maid ruined her favorite non-stick pan with a Brillo pad." Of course, on the very first day I told the new maid not to use Brillo pads and even not to use the harsh green plastic scrubby pads. "Only use a sponge or the white plastic scrubby pads," said me, "because these black pans have a special coating that will be ruined if you use anything else. 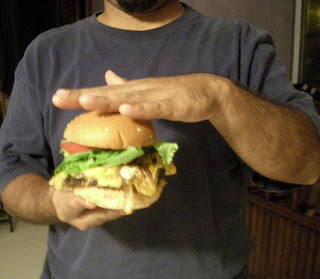 These things (demonstrated in my hand) will scratch the surface." In fact, I even pulled out several other non-stick items and mentioned that all of these things need to be cleaned ONLY with the sponge or white scrubby. "Anything that is black inside is special." It seemed so simple: Silver inside − use whatever you need to clean them. Black inside − only use soft things to clean them. She has been here a month, not every day, but I use that pan so often that I know that she has washed it many times before. Whatever possessed her to decide that THIS time, ALL of the black coating needed to be removed, I'll never know. It is particularly sad for me because after my previous favorite non-stick fry pan was ruined by a maid, I searched literally for years for another heavy quality pan in La Ceiba and San Pedro. They just do not exist here. I finally ordered a good quality pan from Amazon. I had it sent to my sister-in-law in Texas and waited an additional 7 months or so for her to bring it to me! If I recall, they were planning to visit in the summer but ended up canceling their trip so I had to wait until they came at Christmas. All in all, I waited a good 3 years to get this pan. I loved it! Boohoo. So, as Deena mentioned, a new fry-pan is back on my wish list again. Sigh. El Jefe says that I should just throw away all of the Brillo pads and scratchy scrubbies. But we need them for some things! What to do, what to do? I could wash the pans myself, but there will be a time sooner or later when she gets to the pan before I do. Oh, well. Life in Honduras. 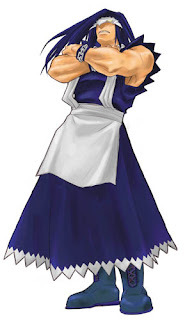 In every other way, I love, love, love this maid! I'll tell you more in another article. 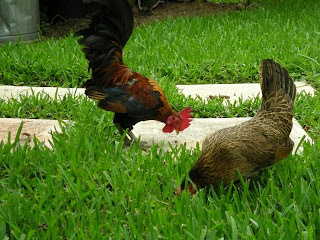 While roosters are notorious for their crowing, which can occur all hours of the day or night − forget the notion that roosters crow to announce the beginning of the day − hens sometimes make their own commotion during and after the egg laying. Not always, but when they get into it, they are a match for roosters any day. We call this loud squawking 'announcing the egg'. Others call it the hens' 'pride of accomplishment' call. 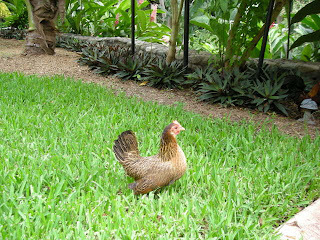 Some of the others hens will offer their own "you go, girl!" encouragement during the ruckus. 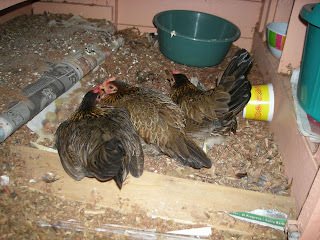 Thankfully, the hens are a little more considerate and don't get into this activity at 3:00 a.m. Isn't it a cute little chicken coop that El Jefe made? By the way, the chicken coop is no longer on the terraza, thank God! El Jefe ran into the typical Honduran problem of not being able to get the end caps to finish the roof. We waited about a year while they ordered them for us. (Yeah, right.) Good thing it wasn't for our house! Reader contest: What is the significance of this? Make a guess. The first correct and complete answer will receive a prize. Problems with your Blogicito email subscription? Sharon mentioned that she has not been receiving the daily Blogicito email updates and thought that La Gringa was taking a break. When she came to the Blogicito and saw that I was posting regularly, she assumed that something had happened to cancel her subscription. But when she tried to resubscribe, Feedburner told her that she already had a subscription. Frustrating! My first guess was that Sharon's email program or internet service provider (ISP) is putting the emails in her spam folder. The solution for that is to find them in the spam folder and do whatever your program requires to mark them as "not spam." That should train your email program to put those emails in your inbox instead. 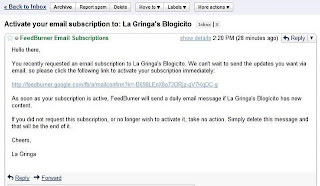 If the emails are not in your spam folder, you can unsubscribe by clicking the unsubscribe link at the bottom of any of the Blogicito emails (if you still have one) and then resubscribe by going to this link: Subscribe to La Gringa's Blogicito by Email. If all else fails, write me and I'll try to reactivate a new subscription request. Please watch for and act upon the automated verification email. It will come from FeedBurner Email Subscriptions but will show as coming from my email address. That is a good time to put my email address in your contacts folder. The subscription will not be activated unless you respond to the verification email by clicking the link. 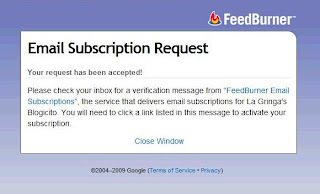 Generally, the Feedburner subscriptions are trouble free − I know because I was my first subscriber back in 2006! Heheheh. I wanted to see how the emails looked and to be sure that Feedburner didn't send unwanted email (they don't). Occasionally there are glitches, primarily because people mark emails as spam rather than unsubscribing, which then can cause other users of the same ISP or web-based email system to not receive the emails. Sorry for boring the rest of you with this, but I always think that when one person mentions a problem, there are others out there with the same problem who didn't let me know. La Gringa values her subscribers! Do you need to speak Spanish in Honduras? Have you been drinking, señor?